My iPhone Got Wet. What Do I Do? Don't Use Rice! You are at:Home»iPhone»My iPhone Got Wet. What Do I Do? Don’t Use Rice! 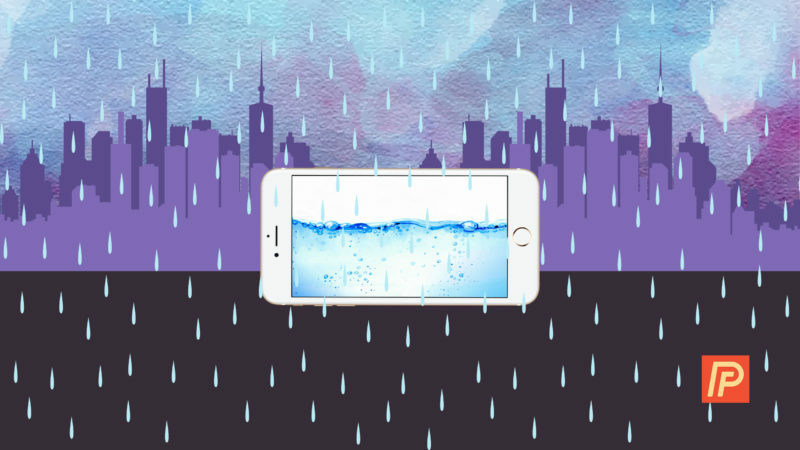 When your iPhone gets wet, it’s an emergency. We know what to do in other emergency situations, but what most people do when their iPhones get wet is about as effective as throwing water on a grease fire: It causes a lot more harm than good. The most important thing in any emergency is to be prepared: Know what to do if your iPhone gets wet, and even more importantly, learn the mistakes people make that cause irreparable damage to iPhones that could have been saved. I got a lot of first-hand experience with wet iPhones when I worked for Apple. Over and over again, I met people who had damaged their own iPhones beyond repair because of the crazy advice they had gotten from a friend. You’re reading part 1 of a three-part series about what to do to rescue, repair, or replace a wet or water-damaged iPhone. I’ll debunk the myths I’ve heard about how to save a wet iPhone, tell you what absolutely not to do, and explain the best options for rescuing an iPhone that may have water damage. The first thing to do if your iPhone gets wet is to remove as much water as possible from the outside of your iPhone. Don’t turn it off – we’re in triage mode now. Your best bet is a microfiber cloth, but if you don’t have one of those lying around (and you probably won’t), the next thing you’ll reach for will probably be a tissue. Warning: This is where we’ll see the first all-too-common mistake people make when their iPhone gets wet. You’ll want to use something that’s very absorbent when you dry your iPhone, but absolutely not something that might break apart or leave residue inside. Yes, tissues are absorbent, but they have a nasty habit of breaking apart when they come into contact with water. If you’re attempting to remove water from your headphone jack and part of the tissue breaks off, now you’re got two problems: A wet iPhone and a headphone jack with a wet tissue stuck inside. Unless you’ve had experience with headphone jacks on iPhones, you would not believe how difficult it is to get anything out of there without damaging the jack itself. Tissues have a second strike against them: They tend to leave dust or residue inside of your iPhone. Don’t use a tissue with aloe: In this case, the cheaper the tissue, the better. If you can rip a regular tissue and dust doesn’t come out of it, it’s probably OK to use. If you do use a tissue, be very gentle, especially when cleaning the charging port and headphone jack. Just stick the tissue in, let it absorb the liquid, and gently remove it. Don’t twist it – the edges inside of the headphone jack can cause the tissue to break apart. On the next page, we’ll deal with the deadliest mistake people make while trying to save their wet iPhone. Read on to find out how trying to dry your iPhone using rice can cause irreperable damage to your iPhone. Previous ArticleMy Responsive Website Isn’t Working. The Fix: Viewport. Next Article How Do I Block Unwanted Calls On My iPhone? A Quick Fix!